"A terrific primer on the corporate control of food in the United States, and the actions of those who fight back" (Raj Patel, author of Stuffed and Starved), Foodopoly takes aim at the real culprit behind America's food crisis: the ever-growing consolidation and corporatization of food production, which prevents farmers from raising healthy crops and limits the choices that people can make in the grocery store. 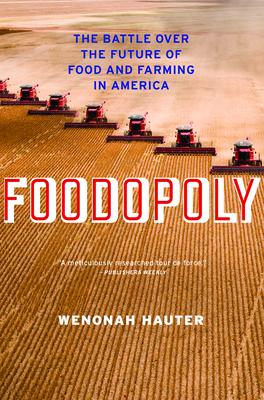 In the tradition of the bestselling The World According to Monsanto, Foodopoly tells the shocking story of how agricultural policy has been hijacked by lobbyists, driving out independent farmers and food processors in favor of companies such as Cargill, Tyson, Kraft, and ConAgra. "A meticulously documented account of how we have lost control of our food system" (Steve Gliessman, professor emeritus of agroecology, UC-Santa Cruz), the book demonstrates how the impacts ripple far and wide, from economic stagnation in rural communities at home to famines in poor countries overseas. In the end, author Wenonah Hauter argues that solving this crisis will require a complete structural shift, a grassroots movement to reshape our food system from seed to table--a change that is about politics, not just personal choice. Wenonah Hauter is the executive director of Food & Water Watch, a D.C.-based watchdog organization focused on corporate and government accountability relating to food, water, and fishing. She has worked and written extensively on food, water, energy, and environmental issues at the national, state, and local levels. She owns a working farm in The Plains, Virginia.